Why can't I install using the All in one option into the Program Files or Program Files (x86) folders? Updates or upgrades of ThumbsPlus can't be installed due to an installation error, in most cases an "MSI" error. There are various other error messages during a failure to install ThumbsPlus that are due to the same problem. 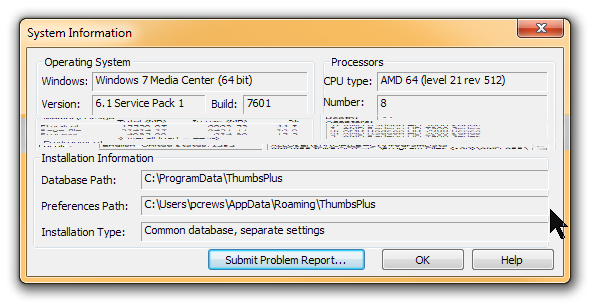 During upgrades, this issue often occurs during uninstall portion of the ThumbsPlus installer. This should correct the problem on your system with the Windows MSI database and cache. Because the file that Windows is looking for has been removed in some manner, you will need to reinstall ThumbsPlus v10 build 4004. That will place the file in the Windows uninstall cache that Windows is looking for in order to uninstall the program. After reinstalling build 4004, you should then be able to uninstall this build and install build 4005. Programs are required to include with their installation files that are needed to uninstall the program. 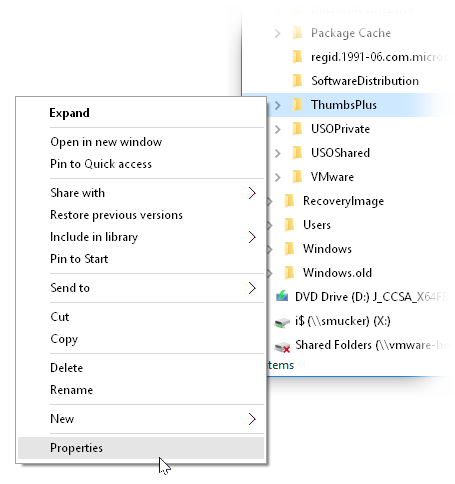 When ThumbsPlus is installed, all of the files needed to uninstall the program are stored in the users Microsoft (Windows) MSI database and cache (which stores install/uninstall files ). 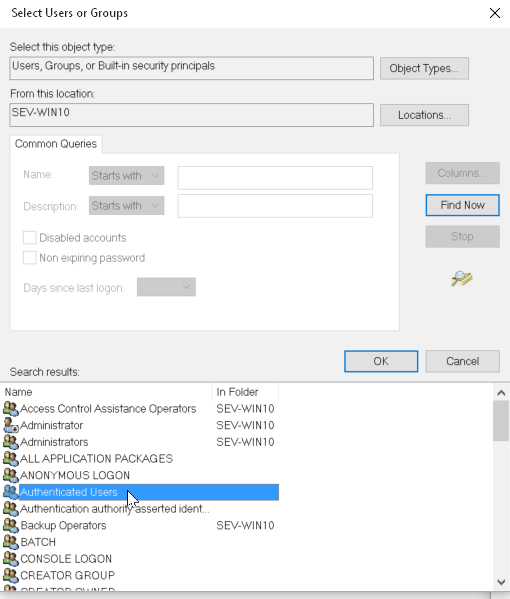 This means that when a user attempts to install a new build of the software, the old files from the previous install have to be in this Windows installation database and registry. Errors occur when, for some reason, these files are not there. These errors may have a myriad of causes, none of which Cerious Software can control. The most likely causes are third-party registry or uninstaller tools, and just about any rip-off software called "tune-up," "system optimizer," or other such hokumware. These "tools" tend to remove or change files that shouldn't be removed or changed. To fix this issue: reinstall the Microsoft VS2012 Update 4 redistributables. You may download directly from the ThumbsPlus web site, or you may download from Microsoft here (click Download, check the box next to VSU_4\vcredist_x86.exe, then click Next). Once the download is complete, just run vcredist_x86.exe to install the components and ThumbsPlus should run normally. During ThumbsPlus installation, we run vcredist_x86.exe to distribute the Visual C++ components. Under some conditions, Windows does not install them correctly when embedded in another installer. Additionally, the uninstall of other programs sometimes improperly removes them. From whatever cause, downloading and installing the redistributables should take care of the problem. Locate your Preferences folder. You can usually do this using Start Menu - All Programs - ThumbsPlus 10 - Utilities - View preferences folder. If this isn't available, use Help - System Information from within ThumbsPlus, and navigate to the Preferences Path (near the bottom) in Windows Explorer. 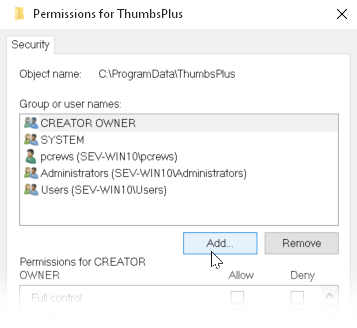 Change the Windows permissions for the folder using the instructions Setting permissions on a folder for ThumbsPlus below. 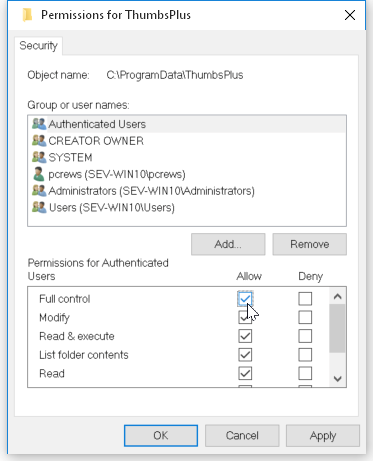 Whenever the ThumbsPlus installer creates a new folder for the database or preferences intended for sharing between users, it sets the folder's Windows permissions to allow all access to that folder (and any subsequently-created folders or files) by Authenticated users. However, if the folder already exists, the installer skips this step because it can be take a very long time (minutes or hours) if there is a database within the folder that uses the Thumbnails in Files option, and the folder should have had its permissions set properly before. Sometimes, because of a faulty installer or subsequent changes in the file system, you need to do this step manually. If the folder already exists, ThumbsPlus skips this step in case it contains a database with "Thumbnails in Files" in the folder. Locate the folder that contains the database. You can usually do this using Start Menu - All Programs - ThumbsPlus 10 - Utilities - View default database folder. If the Start menu is not available, or if you've created a database in another location, use Database - Statistics from within ThumbsPlus to show the full path to the current database, and navigate to this path in Window Explorer. Now, change the Windows permissions for the folder using the instructions Setting permissions on a folder for ThumbsPlus below. 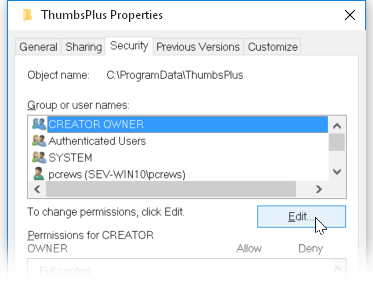 Whenever the ThumbsPlus installer creates a new folder for the database or preferences intended for sharing between users, it sets the folder's Windows permissions to allow all access to that folder (and any subsequently-created folders or files within it) by Authenticated users. However, if the folder already exists, the installer skips this step because it can be take a very long time (minutes or even hours) if there is a database within the folder that uses the Thumbnails in Files option; in this case, the folder should have had its permissions set properly before. Sometimes, because of a previous faulty installer or subsequent changes in the file system by Windows or other software, you need to do this step manually. ThumbsPlus will still run on Windows XP (SP3 required) and Windows 2003. However, Cerious Software cannot provide official support for these operating systems. Windows XP and Windows 2003 are no longer supported by Microsoft, and ThumbsPlus 10 is the last release of ThumbsPlus that will even unofficially support them. I had intended to completely remove XP support in version 10, but since it still runs, I've let it remain until either a future service pack or version 11. I do not do any significant testing on Windows XP or 2003. I basically make sure that the program starts and basic functions operate normally. If you have a problem on XP that we can't replicate on later versions of Windows, you're basically on your own. Main window: The mouse wheel will scroll whichever panel the mouse pointer is hovering over, including the preview window. To scroll the preview window horizontally, hold SHIFT while turning the wheel, or use the wheel tilt left/right if supported by your mouse. Note that zooming in the preview window only zooms to the level of detail loaded for the preview, which for many image types is less than the full resolution of the image. View window: The wheel will scroll (pan) the image. To scroll horizontally, tilt the wheel (if supported), or hold SHIFT while turning the wheel. To Zoom, hold CTRL while using the wheel. You can make zooming the default use for the wheel in Options - Viewing - Other, Use mouse wheel to zoom in/out on image. When selecting a sort order, you can press SHIFT to toggle ascending/descending. I use this most often to switch back and forth between sorting by Name (ascending) and Date Taken or Date Modified (which I prefer to see in descending order). Holding CTRL while selecting Quick Process - Convert to - type will bypass the Options dialog for the file type. Only use this for JPEG files if you're sure the last used options are what you really want; otherwise, you may end up with some ugly JPEG files! When pasting in the main window, ThumbsPlus will paste a metafile in preference to an image, since metafiles usually contain more detail. However, some applications—notably Adobe Photoshop—put both a vector (metafile) and raster (image) item on the clipboard. To avoid the step of extracting the image (Transform - Extract Bitmap) from the Photoshop metafile, you can hold SHIFT when pasting (from the menu or toolbar) to cause ThumbsPlus to prefer raster over vector when pasting. To force a bitmap paste using the keyboard, hit ALT+E, then SHIFT+P. When pasting into an existing image, ThumbsPlus always loads the raster, so there's no need to do this within a view window. To change your slide show options and start a slide show in one step, hold SHIFT or ALT when clicking the slides how toolbar button or menu item. Here are the steps for modifying the permissions so that all authenticated (logged-in) users on the system can update the database or store preferences. If you're only concerned about yourself (the current user), you can substitute your user name for Authenticated Users in the examples. The screen shots are from Windows 10, but the steps are the same on all supported versions of Windows. 1. Select the folder in Windows Explorer. Hit ALT+ENTER or right-click and select Properties. 3. If your own account is listed, select it and make sure Full Control is checked. (added 29 July). 6. Click the Advanced button, then click Find now, then select Authenticated Users from the list, and click OK.
7. 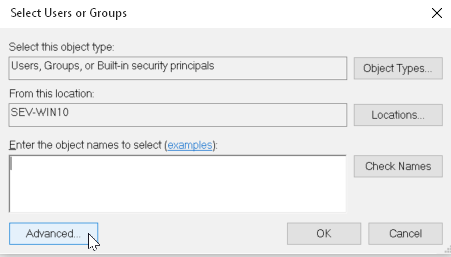 Select Full Control under Allow, which will automatically check the other permissions, then click OK.
Also ensure that your personal account and Administrators also have Full Control checked! (added 29 July). 8. Click OK. Windows will set permissions on the folder and all files within it. If there is a database with thumbnails in files, this may take a little while.